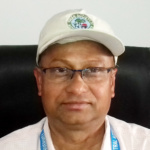 Research Interests: Structure and function of man made plantations including parameters of biomass, structure, litter-fall, net primary production, energetics, turn over of nutrients of tree and crop layers, nutrient cycling and carbon sequestration. Panwar, P.; Chauhan, S.; Kaushal, R.; Das, D.K. ; Ajit; Arora, G.; Chaturvedi, O.P. ; Jain, K.; Chaturvedi, S. and Tewari, S. (2017). Carbon Sequestration Potential of Poplar-based Agroforestry using the CO2FIX Model in the Indo-Gangetic Region of India. Tropical Ecology 58 (2): 439-447. Das, D.K. ; R. Laik; and O. P. Chaturvedi (2015). Biomass production and nutrient dynamics of Acacia lenticularis (L.) Willd-Curcuma domestica Valeton agroforestry systems in north-west alluvial plain of Bihar. Indian J. of Agroforestry 17 (1): 74-80. Das, D. K.; O. P. Chaturvedi, R. K. Jha and Rajeev Kumar (2011). Yield, soil health and economics of aonla (Emblica officinalis Gaertn. )-based agrihorticultural systems in eastern India. Current Science 101 (6): 786-790. Ajit, D. K. Das, O. P. Chaturvedi, Nighat Jabeen and S. K. Dhyani (2011). Predictive models for dry weight estimation of above and below ground biomass components of Populus deltoides in India: Development and Comparative Diagnosis. Biomass and Bioenergy 35(3): 1145-1152. K. Das, O. P. Chaturvedi, R. Laik, R. K. Jha and A. K. Chakraborty (2010). Aerial tree biomass and nutrient status of soil in Acacia lenticularis (L.) Willd plantations in relation to stand density. Indian Journal of Agroforestry 12 (1): 8-12. Das, D. K. and O.P. Chaturvedi (2009). Energy dynamics and bioenergy production of Populus deltoides G-3 Marsh plantation in eastern India. Biomass and Bioenergy 33(1): 144-148. Das, D. K.; O. P. Chaturvedi; A. K. Chakraborty and M. S. Ali (2008). Effect of the planting dates and cutting portions of the shoots on sprouting and growth behaviour of Populus deltoides Indian Journal of Agroforestry 10 (2): 54-57. Das, D. K., O. P. Chaturvedi, M. S. Ali and R. Kumar (2008). Effect of leaf litters application on the growth and biomass production of Azadirachta indica Juss seedling. Range Management & Agroforestry 29 (2): 115-118. Das, D. K. and O.P. Chaturvedi (2008). Root biomass and distribution of five agroforestry tree species. Agroforestry Systems 74(3): 223-230. Das, D. K., O.P. Chaturvedi, M. P. Mandal and R. Kumar (2008).Effect of tree plantations on biomass and primary productivity of herbaceous vegetation in eastern India. Tropical Ecology. 49 (2): 95-101. Das, D. K. and Nand Ram (2007). Properties of humic and fulvic acids under long- term use of fertilizers in a rice-wheat-cowpea system on a mollisol. Acta Agronomica Hungarica 55 (3): 293-296. Das, D. K.; O. P. Chaturvedi; M. P. Mandal and Rajeev Kumar (2007). Reclamation of degraded soil through tree plantation –Litter and fertility changes. Indian Forester 133 (5): 647-654. “This website belongs to Dr. Rajendra Prasad Central Agricultural University, Formerly RAU, Pusa, Samastipur, Bihar, India”. | © Copyright 2017. All Rights Reserved.